Finnegan Purl Knits: Busy Day! This will be a very busy day so I'm sneaking this post in quickly! 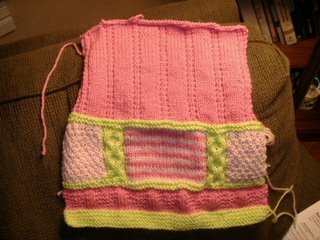 Finished the back of the baby sweater last night. I think I'll do sleeves next just because I tend to do that all the time. I don't know why. Maybe because they're quick and I like instant gratification. 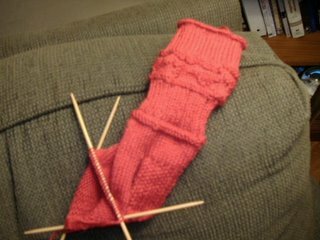 I also made some good progress on the Valentine's day sock after I finished the back of the sweater. I really had to laugh when I glanced down at the instructions after I turned the heel. It said, "Continue working in established rib stitch over middle needle." I guess I missed that part after I did those last three rows of garter stitch. I did not continue in a rib stitch. I did a stockinette stitch. So much for "mindless knitting". People with ADD should not try to knit and talk at the same time!!! Oh well, it really doesn't matter. These are for me and I sure don't care. It was just a stash busting project anyhow. Thanks for all the nice comments yesterday. Nora is right, relationships are more important than painting walls. And if the walls have waited this long, they can wait a little longer. The closing went off without a hitch which is good. Today I can relax and go about my normal routine which is going to keep me hopping but which is a lot less stressful. What fast fingers you have! I love the sweater. So pretty and feminine. Beautiful sweater -- really puts mine to shame! Looks like you've conquered your knitting demons for the time being.